via sctimes: Michael C. Hall has turned a page, broken with the past, made a break. No more sawed-off limbs, gruesome murder, headless bodies or infants sitting in puddles of blood. His serial killer Dexter is no more, giving way to a Broadway play about two suburban couples. “There’s really no room for so much of what Dexter called on me to do in this. Including killing people, thankfully,” says Hall in his freshly painted Broadway dressing room. So the body count is low? “Just a squirrel,” says Hall. Hall is one of an impressive quartet of actors starring in Will Eno’s play “The Realistic Joneses.” The former Showtime sociopath joins Toni Collette, Marisa Tomei and Tracy Letts. A dark comedy, the play is about two couples who have more in common than their identical homes and their shared last names. It’s an off-kilter work about the thirst for human connection and understanding. It was the perfect antidote to Hall’s post-”Dexter” blues. Few may know that before he picked up the scalpel, Hall was a thespian and a song-and-dance man and now he wanted to return to theater. He even did an early workshop for the Broadway-bound “Big Fish” but his schedule didn’t work out with “Dexter.” Read the full article after the jump. 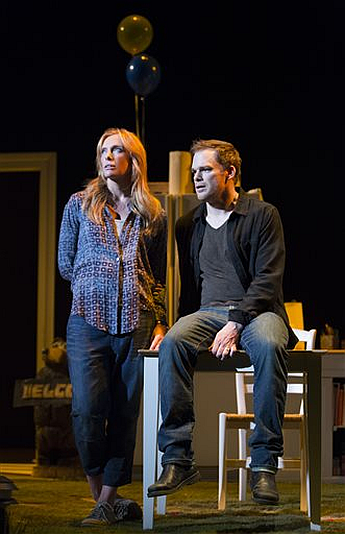 He got it all in Eno’s play, which first premiered at the Yale Repertory Theatre in 2012. Hall was invited to a reading before it came to New York and wolfed down the script in one sitting before getting on a flight to New York. “When I was told that I got that part, everything that has happened beyond then has been beyond anything I ever really imagined. That was really the moment of, ‘Wow. Maybe I’m really going to get away with this,’” he recalls. He fully intended on a stage career after graduating from New York University and threw himself into Shakespearian roles and even the musical “Chicago.” ‘’It’s where I came from. It’s what initially drew me to acting,” he says. His break-out roles — David Fisher, funeral director that Hall played in the early 2000s on HBO’s “Six Feet Under” — and then “Dexter” took him away. Both earned Hall Emmy Award nominations. Hall will return to those waters soon when Showtime airs its new series on climate change next month, “Years of Living Dangerously.” Hall was one of several celebrities — including Jessica Alba, Harrison Ford, Olivia Munn and Matt Damon — sent over the globe to report. Hall spent two weeks in Bangladesh.